The New Microbiologica, 2016. July ;39(3): 228-231. Endogenous Retroviruses in humans (HERVs) are derived from ancient viral infections which over time became part of the usual human genome. In fact, they make up 8% of the total genome (98,000 fragments, some from Neanderthal times). Recent research has shown that some of them can be reactivated and are linked to diseases such as MS, ALS, and possibly schizophrenia. 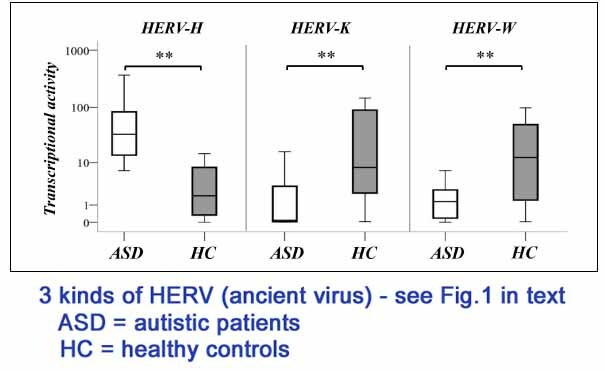 In their 2016 study, they have compared three of these ancient viruses and suggest that the HERV-H (see chart in the picture above) should be studied as a possible marker for early detection of children at high risk for autism before symptoms appear, and for development of new therapies. They are currently working on this using rats. NOTE: While I see that they are focusing on the HERV-H which is much higher in children with autism, they also mentioned that the other two ancient viruses in the chart are much higher in healthy children. Could they possibly be in some way protective? This entry was posted in 2016-2020, Autism, Environment, Immune System, Prenatal Exposure, Research Studies, Schizophrenia. Bookmark the permalink.